Lanzilo is a beautiful, very well-built dog with a longer back, a clear nose and snout, full jaws, good tail, nice wide breast, and an enormous amount of stamina and energy. Lanzilo has no respiratory problems at all and he also jumps up and down without any problems. Lanzilo is a real asset to our kennel in terms of health and type! He does not play with adult males on his own grounds but outside his own area he can do everything and he loves people and children a lot! Even with the extreme heat here in Hungary with 40 degrees he has a completely free breathing without any noise. He passes on his construction (type) free breathing and character to his offspring in combination with a healthy female. 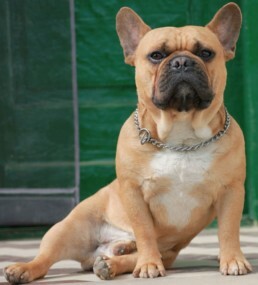 Only FCI recognized colors and the females must be in possession of a recognized pedigree and DNA profile. No blue and merle carriers! More information can be found under “Our health tests” Click here. 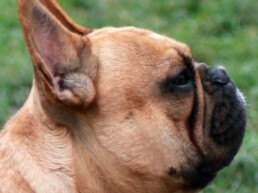 Lanzilo has been fully tested by 16 months of age (including a x-ray of his back) (more X-rays were in that time not made at the French Bulldog specialist at Sleeuwijk) See these first beautiful results at the bottom of the page. Lanzilo has been tested for the second time at 6 years and 6 months of age (including x-ray of his back, knees, elbows, hips and larynx) “with very good results for his age” at the Veterinary Clinic Szekszárd Center. See these second results and the minor changes at the bottom of this page. We are very proud of Lanzilo! 191 additional disease mutations found in other breeds were also tested. No findings for this dog.